Judge and Technical Delegate Training Seminar for 2018. 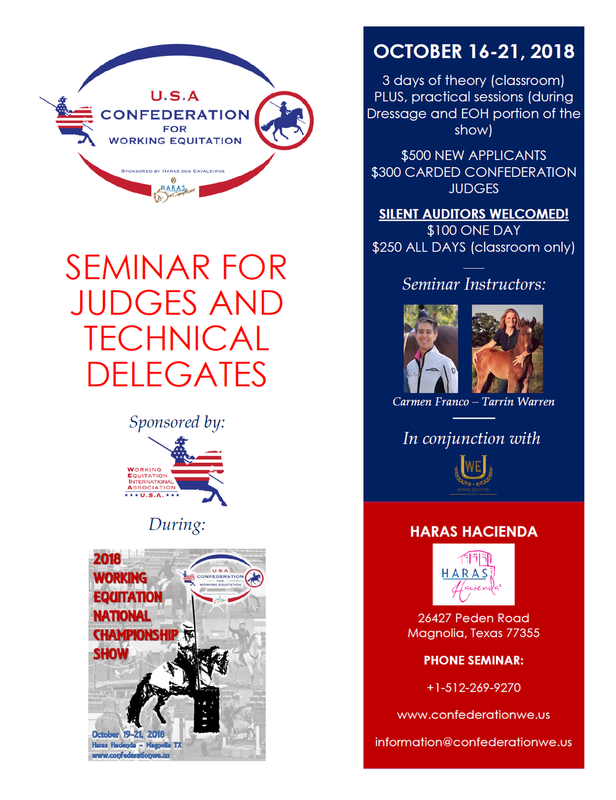 Our very successful Seminar (sponsored by WEIAUSA) from last year is coming back to our first class host Haras Hacienda, October 16-21 during our National Championship Show. In order to allow each candidate to have personal attention we have been limiting the class size to 10 candidates. This allows ample time to ask questions, have good discussion and allow each participant the opportunity to get a significant amount of practical experience. Another outstanding opportunity for all, is the option to attend as a silent auditor. This is a great deal for ANYONE who is interested in being at the top of their game in Working Equitation. It really helps you to understand exactly what the judges are looking for. Don't delay in registering for this seminar as there is a lot of interest for it. Newer PostCheck your email for our June 2018 Newsletter! All rights reserved, Confederation for Working Equitation. Copyright © 2016-2018. No part of the materials on this website, including graphics and downloadable documents may be used, in whole or in part, without specific permission from the Confederation for Working Equitation.